Esta foto fue tomada cerca de 1980 en el patio de la casa de la familia del Señor Fazlur Rahman, junto a su esposa, y con nueve de sus diez hijos. A nuestra comunidad de 4 compañeros nos rentaron la parte de su casa que dio a la calle, Tangail, Bangladesh. The following is the introduction to my book "Bengali Language Analysis", published in 2016. Its value lies in the treatment of language learning as an essential part of one's inculturation with people of another culture. Thus it speaks of a key element in the evolution of my own missionary calling and life. By JOHN P. MARTIN, M. M.
This compilation is the result of 10 years of study and immersion into the Bengali Culture and Language, during the years from 1975 to 1981, when I was living in Bangladesh, and from 1991 to 1994, when I was living in Calcutta and Shantiniketan in West Bengal, India. Fundamental Bengali, A Grammar, by Biren Bonnerjea, Harinath Press, Dacca, East Bengal, Pakistan. Introduction to Bengali, by Edward C. Dimock, Jr., Somdev Bhattacharji and Suhas Chatterjee, East-West Center Press, Honolulu, Hawaii, 1965. A Practical Bengali Grammar, by W. S. Milne, Calcutta, 1913. Bengali for Beginners, by W. Sutton Page, Baptist Mission Press, Calcutta, 1919. Bengali Language Handbook, Punya Sloka Ray, Muhammad Abdul Hai and Lila Ray, Center for Applied Linguistics, Washington DC, 1966. Bengali for Foreigners, by Brother James (Tallavorich, CSC), revised second edition, University Press Limited, Bangladesh, 1982. I copied texts from these sources and included them in my analysis without any direct attribution. When I started this work over 40 years ago, I had no idea that this book would be the result and so I did not preserve any references to what I was lifting from these books. Plagiarism plain and simple! I have selected material from these sources as they seemed fit to me for learning Bengali and useful for the analysis that I was constructing over the course of those 10 years. I have not been able to eliminate all duplications of material nor to display all of it in the logical and pleasing to the eye fashion that would be appropriate for the structure that I was employing. Suspected duplications of material have also been included, lest they be lost. These latter materials are at times seen as being crossed out, which may indicate that the material had already found a more appropriate place in the analysis. The cut and paste method that I used is obvious on many pages as I had occasional access only to local copying machines, with the best quality that their owners could supply. My handwritten notes from a variety of paper styles have been gathered from my earliest days of studying Bengali, as I can discern from my first stilted orthography. Page numbers within the files refer to my initial arrangement of the material and have not been eliminated from the pages prior to scanning. There is no use in paying attention to them, only to the pages at the bottom. I want to acknowledge the valuable lessons in linguistics that I learned from the Summer Institute of Linguistics course under the Wycliffe Bible Translators that I took at the University of Oklahoma in the Summer of 1964, which has helped me immeasurably to learn and understand both the Spanish and the Bengali languages. I am indebted to my Bengali teachers at the Oriental Institute in Barisal, Bangladesh from 1975 to 1976 for their kind efforts and sacrifices in sharing with me the riches of their language and culture. I am indebted most of all to the countless Bengali people with whom I lived for 10 years for their kindness in sharing with me the riches of their language, culture and religious and family values. I am aware that there may well be other, newer and better methods and perspectives for analyzing the structures of a language than the one I have used here, exclusively of my own creation, with lots of help from the above author’s works as well as my well learned lessons in linguistics in 1964. It is my hope that in some way this work, despite its lack of coherence and visually pedagogical display, can help others to understand the Bengali language so as to be better able to learn or to teach Bengali. I have learned that there are similar structures in both English and Bengali, by golly, such as our idiomatic use of alliterative duplications: willy-nilly, topsy-turvy! Another one has to do with our phrases constructed with a verb and a post-positional word with a wide variety of meanings: run up/down/into/by/from/to, etc., yup, with the same type in Bengali! This has been fun to witness in my own language, knowing that English may well have common roots with Bengali, as so-called “Indo-European” languages. To have finished this task of arranging and printing all of this material has more to do with my heart than my brain. I feel a tremendous satisfaction at having done this work which has been sitting on my unconscious to-do list for decades. I know for sure that this task has to do with the personal internal dynamics of my relationship with the Bengali people, which began for me with a severe culture shock experience within the first week of my arrival in Bangladesh on December 6, 1975. My subsequent reflection on my response to this trauma led me to realize that having been scared away from wanting to relate spontaneously to these people, instead I chose to apply my considerable intellectual skills to analyzing their language. Copying my earlier very successful experience in Mexico, I believed that I should learn the language well and then I would be able to communicate with the people. So I set about this constant labor of learning Bengali my own way. Yet while eschewing the opportunity to learn it from my day-to-day contacts with the people (or so I unconsciously thought), I did gain a fair fluency in the end, and paradoxically I also made some great friends among the Bengalis as well. What greater fluency and more and better friendships could I not have made were I less encumbered by my need to process the consequences of that initial trauma! This section presents a glimpse of one key activity of Father John Martin in Mexico, the formation of a community of Maryknoll Affiliates in Merida, Yucatan, who dedicate themselves to growth in their missionary spiritiuality with a commitment to live it out in their ordinary lives. In Tangail, Bangladesh in 1997 at the Islamic University, John discovered deep friendhip with Masud Khan, its director, and his wife and son. Interfaith presence in Ajmer, Rajasthan, India, c. 1990. We gathered near the most celebrated Sufi Muslim shrine in India, the tomb of Khaza-Mounuidin Chisti, a 13th Century Muslim saint.. 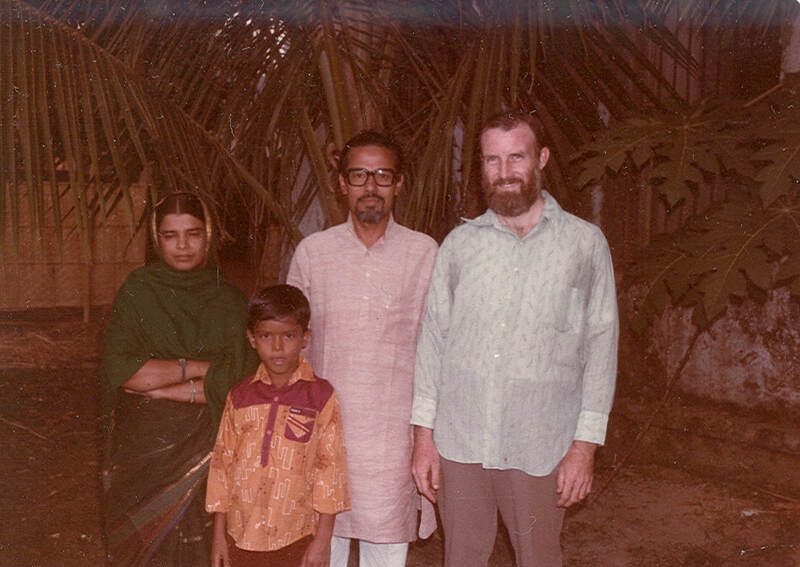 The author with Father Bede Griffiths in December 1979 at Shantivanam Ashram, Trichy, Tamil Nadu, India.